Breakfast: grain free almond joy pancakes (almond flour, raw cacao powder, unsweetened coconut shreds, cacao nibs, raw cacao protein powder ‘frosting’), roasted kabocha. 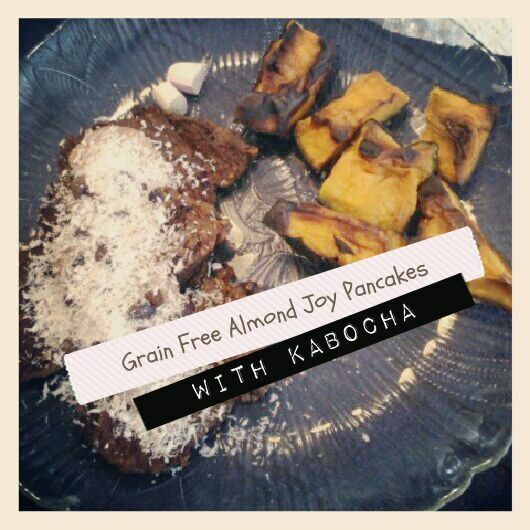 I’ve been moving away from my beloved homemade buckwheat waffles to grain free pancakes. I change my breakfasts up every few months and now I’m on a pancake kick, especially almond or peanut flour based pancakes. They’re not pretty but they’re tasty and easy to whip up and change around. 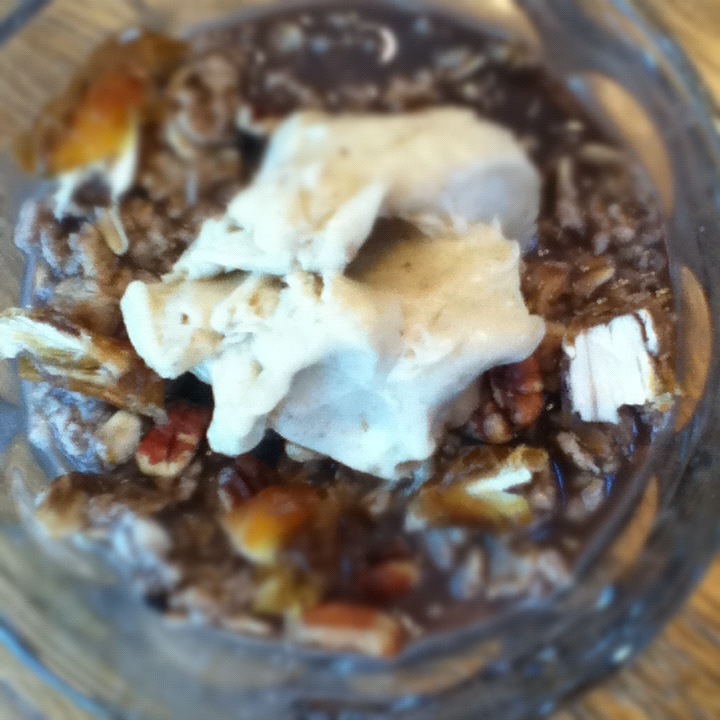 The almond joy inspired combo is a real winner…I can’t believe I hated coconut for so long! My new hair (and new-ish dress). I had a long overdue hair appointment on Friday. Seriously, I hadn’t gotten it done since August, yikes. I got more blonde highlights added and took the plunge and got full bangs, rather than my usual sideswept. 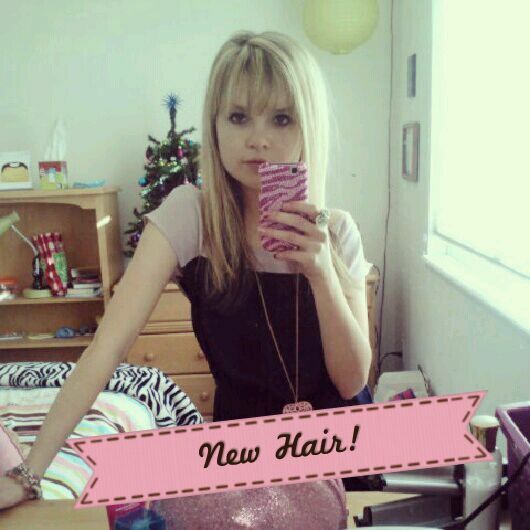 I gotta say, I love my new bangs. I feel more adult and fashion-y, if that makes any sense. 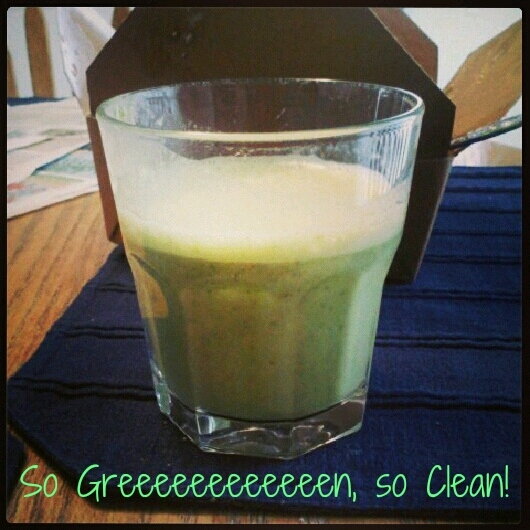 Lunch part 1: green smoothie (made with unsweetened almond milk, spinach and Sunwarrior vanilla). I don’t do smoothies a lot (they’re too filling for me, and I’d rather eat my calories) but I wasn’t feeling a salad today so I went for my greens in smoothie form. I actually didn’t finish this because it was getting too filling, but it was pretty delish. I think I’ll be doing more green smoothies for lunch this semester on busy days. Lunch part 2: Whole Foods salad bar leftovers. 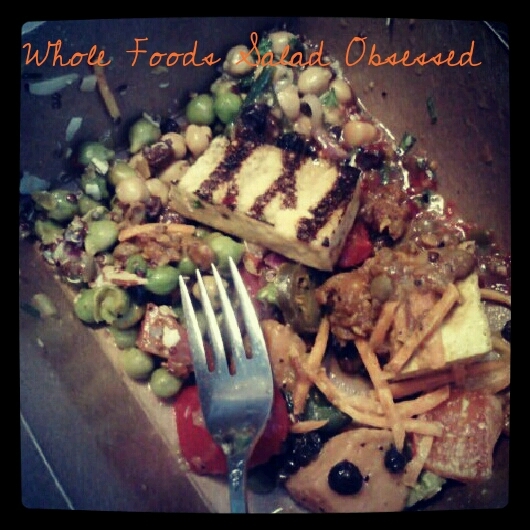 Sorry for the millions of Instagrammed WF salad bar photos–can you tell I’m obsessed?! I’ve just been trying to get my fill of the salad bar while I’m still home on break because as I’ve said before, the WF near me at school has a subpar salad bar. Though, I haven’t been there in over 5 weeks, so maybe they’ve improved it…? I celebrated the Golden Globes on Sunday with half of this box, and saved the rest for Monday’s lunch. Leftovers have never tasted better! Snack (reused photo, minus the bok choy): half garnet yam with peanut flour ‘frosting’, sunflower seed butter, mini dark chocolate chips and chopped dried fig. As you may have noticed, I haven’t been eating too many grains lately. Not necessarily on purpose (oh and BTW, I am NOT going paleo, I could never eat all that meat/eggs), just because I’ve found that other things are more appealing to me, plus I just like to switch things up and I’m actually doing a lot more experimenting now without relying on grains for most of my meals. 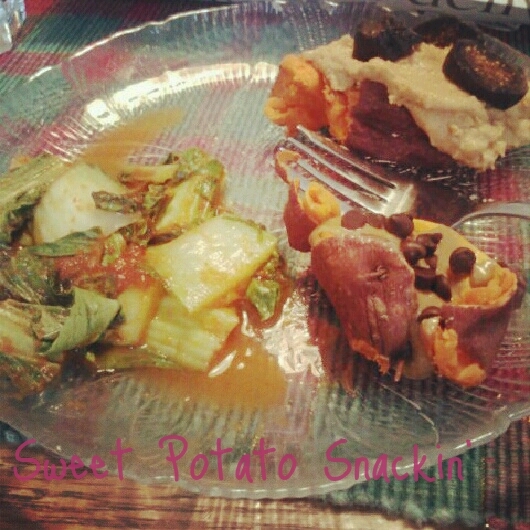 Anyways, my favorite snack at the moment is a sweet potato/yam topped with SSB, peanut flour paste, dried fruit and chocolate chips. Sweet potatoes are a great filling snack option, and they’re just amazing topped with nut butters and chocolate. Trust me, it sounds weird but when the chocolate gets all melty, you’ll understand my obsession. 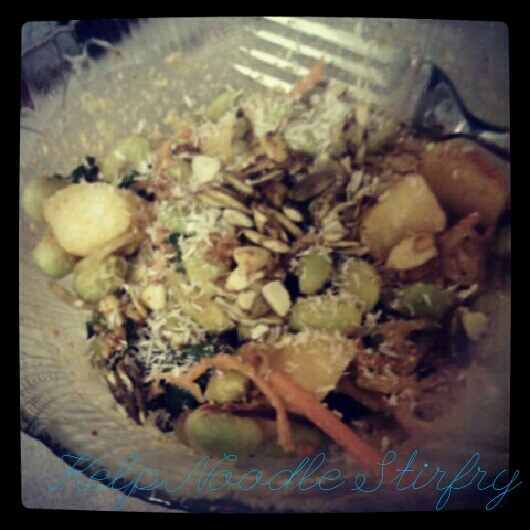 Dinner: peanut coconut curry kelp noodle stirfry with kale, pineapple, peanut flour and edamame. I’m so glad I discovered kelp noodles, because they’re my favorite easy go-to dinner lately. 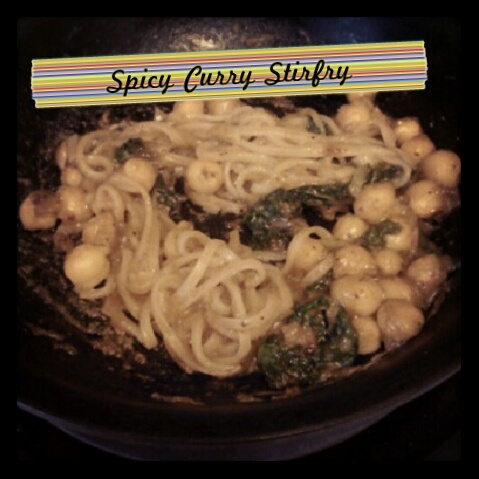 They don’t add any weird taste and soak up other flavors easily so they’re perfect in stirfrys. I know a lot of people like using spaghetti squash as a pasta replacement and as much as I love squash, the spaghetti variety isn’t my fave. 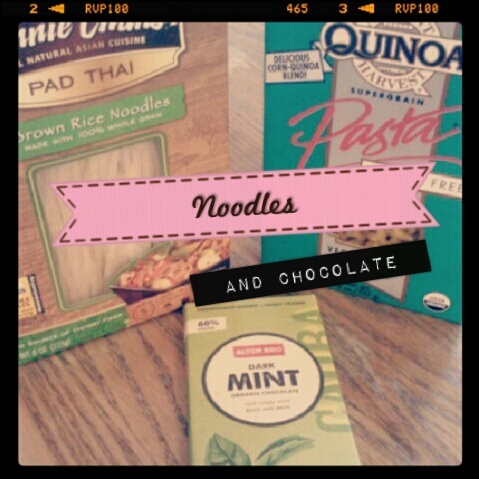 Kelp noodles are also a veggie-based pasta replacement (a sea veggie, so they have a lot of minerals!) but I just like them better, and there’s minimal prep work involved with them. 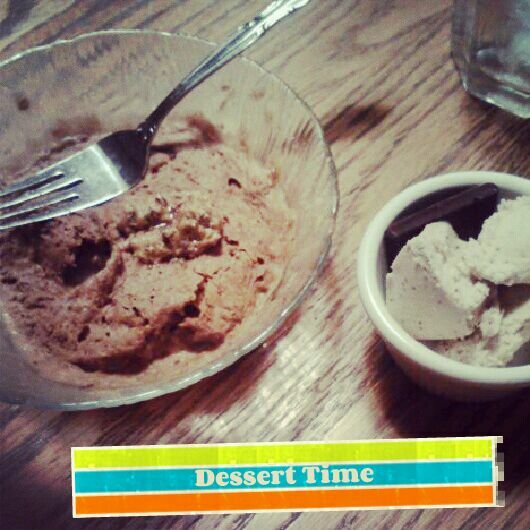 Dessert: PB chocolate protein microwave cake topped with sunflower seed butter, mint chocolate almond milk ice cream, Alter Eco dark mint chocolate square. Have you been making any changes in your life lately? What’s your go-to breakfast? Well guys, here we are again, at the end of another year. I hate being cliche, but where the heck did 2012 go? I feel like as I get older, the years fly by so much faster than when I was a kid. Not that I’m complaining, but it’s crazy to me that I’m practically done with college! I’m really excited for 2013. I have no idea exactly what will happen, which scares the type-A planner in me, but it’s exciting to think about all the things that could happen this year. For one, I’m finally turning the big 21 in July. Don’t get me wrong, I’m not big into drinking or anything but it’ll be nice to be able to order a good drink in a restaurant sometimes, or enjoy a cool cocktail at home. Also, I might possibly be graduating in December–crazy talk! I really want to get all my credits done in time so I can graduate a semester early and get started on my first big girl job. I know a lot of people would rather stay in school as long as possible but I’m so excited about my future career (hopefully as a meteorologist) that I want to get a head start! I don’t want to drag this post on forever, so I’ll just share some brief highlights from the year with you and then give you a delicious, quick recipe at the end. I finally got a Twitter, I experimented more with raw recipes and I overcame my hatred for hot tea. 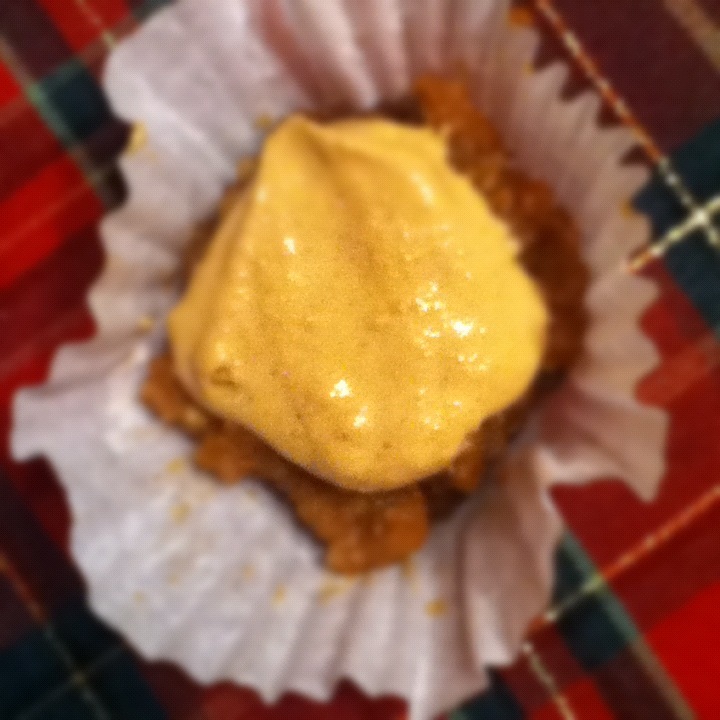 Raw carrot cake bite with peanut flour frosting. I tried a bunch of new-to-me products, did a raw food challenge and went to a father daughter dance with my sister and dad. Dressed up for the dance. I reevaluated my recovery journey and eating habits, got an internship at a local TV station and made a bunch of recipes over spring break. Enjoying the sunshine during spring break. I celebrated Easter with the fam, tried Zevia for the first time and got ready for summer food & fun. I finished up my sophomore year of college, made my first pancakes from scratch and celebrated my blog’s first birthday. Peanut flour pancakes with homemade strawberry vanilla jam. I talked about why I eat healthy, made a goal to stop counting calories and moved to a new house. Eating applesauce on the go. I embraced my love of healthy fats, made my go-to meal for the first time and celebrated my 20th birthday. The delicious vegan cake I enjoyed on my birthday. I tried vegan sushi, almost saw the President and started budgeting my grocery shopping. Vegan sweet potato tempura sushi rolls. I overcame my fear of coconut, had jury duty and embraced fall. I also did my first giveaway! 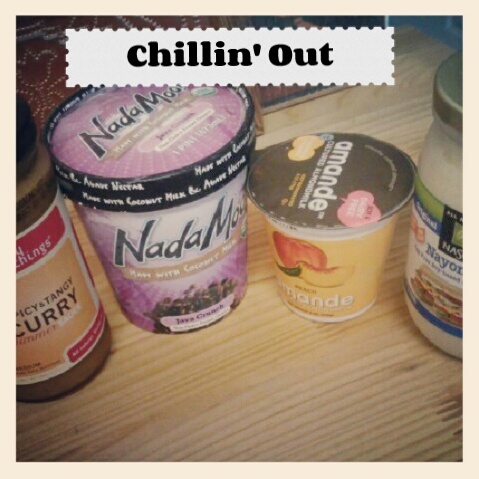 I participated in Vegan MoFo, started my addiction to kabocha and broke some fashion rules. My first Fashion Friday post. I shared my Christmas wishlist a month early, proved that vegans can get protein too and spent Thanksgiving break writing papers. Almond cake vodka on Thanksgiving. I proclaimed my love for the Whole Foods salad bar, stressed out about finals and had an enjoyable (while sick) Christmas. It was a white Christmas after all! And now for the recipe! I don’t know about you, but after Christmas, some nights I’m feeling lazy and I just want a quick dinner to throw together so I have more time for family game and movie nights. This stirfry recipe comes together in 10 minutes and is easy to customize to your tastes. I used kelp noodles as the base because I love their texture and how they can bulk up a meal without adding any calories but you can use rice or soba noodles if you prefer. In a small bowl, stir together coconut milk, curry powder, red pepper, peanut flour and aminos until thickened and combined. 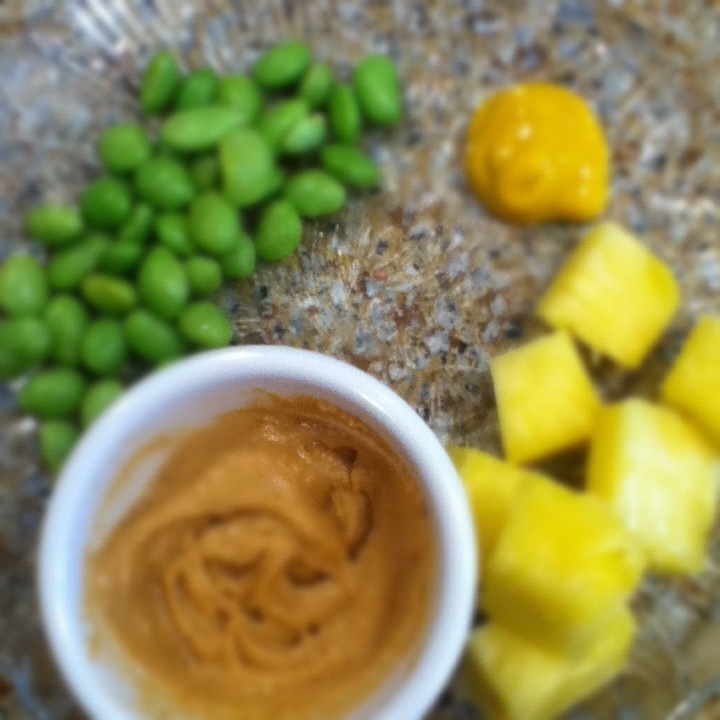 In a medium pan over medium heat, cook edamame, veggies and pineapple in a small amount of coconut oil. Add in kelp noodles and stir sauce over noodles. Cook for 5 minutes or until mixture is hot and sauce thickens up a bit. Serve topped with shredded coconut, chopped peanuts, pumpkin seeds or a drizzle of sriracha. Serves 1. What are some of your favorite memories from 2012? What’s one new thing you tried this last year? 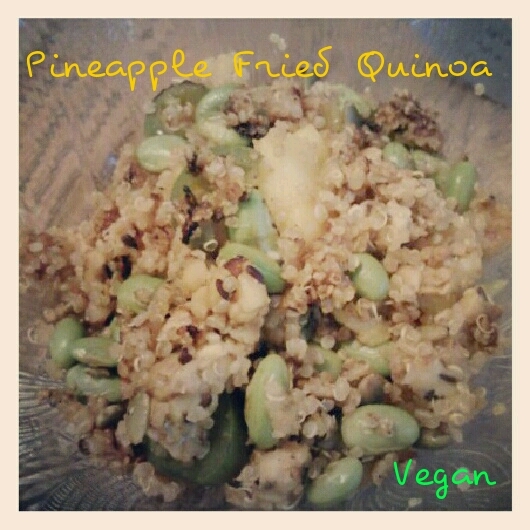 Recipe submitted to Healthy Vegan Friday #23. Hey guys! Sorry I’ve been slacking on the commenting lately, but today is my 20th birthday and the start of my unofficial birthday weekend so I’m probably going to take the weekend off from the computer but I’ll try to comment here and there if I have time. I’ll be back early next week with a birthday weekend recap but for now, here’s a quickie recipe I threw together for dinner last night. If you follow me on Twitter, you might have seen the tweet and picture I had for it. Anyways, it’s super delicious (and spicy, of course! ), easy to make and totally customizable to your tastes. Like fried rice but fresher and healthier! Cook quinoa according to directions on package. 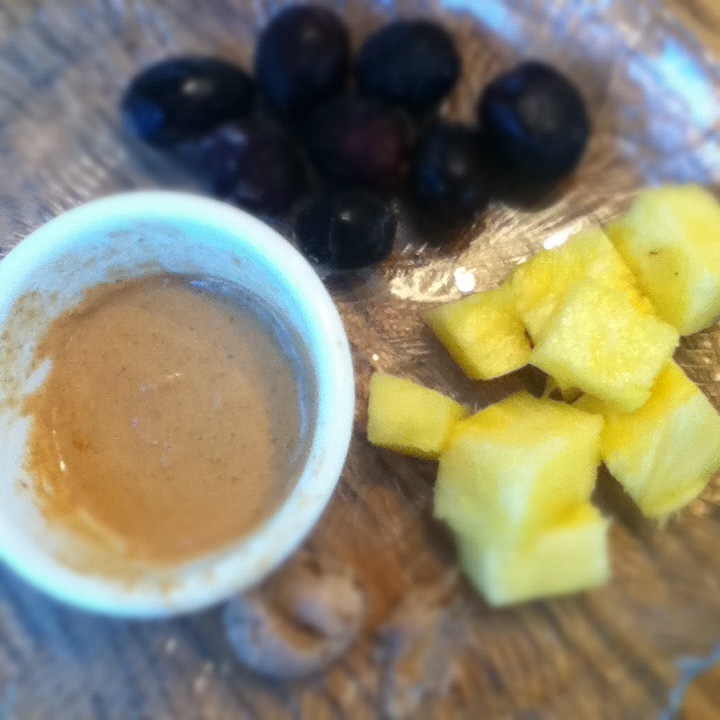 In a small bowl, stir together tamari, pineapple juice and sesame oil until combined. Add in ground ginger and curry powder, to taste. In a large saucepan or wok, heat a little olive oil and add in your protein. Cook until browned. Stir in pineapple tamari mixture, fresh pineapple, jalapeno, seeds/nuts and quinoa and stir occasionally, for 5 to 10 minutes, or until quinoa is browned and a little crunchy. Makes 1 serving. What are you doing this weekend? What do you like to put in your stirfrys? 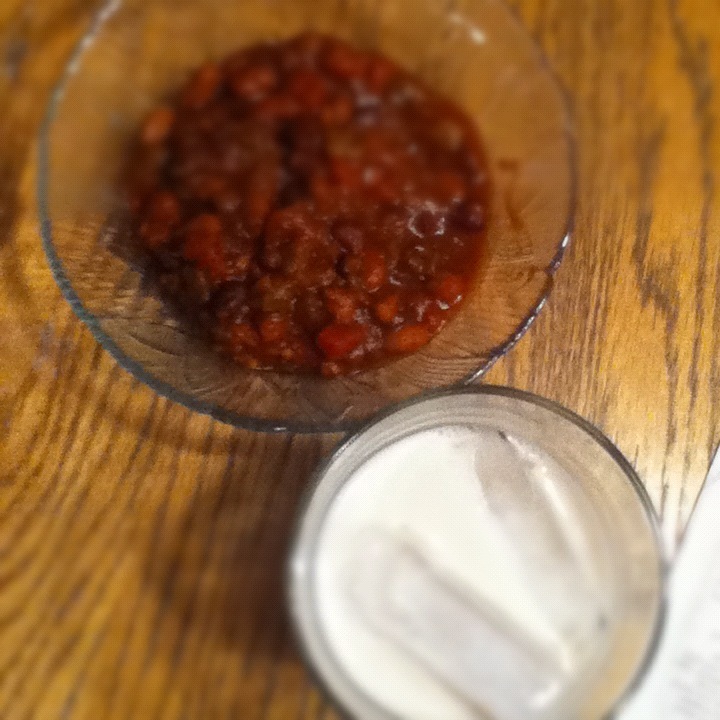 This recipe is being submitted for this week’s (August 12) Healthy Vegan Friday. 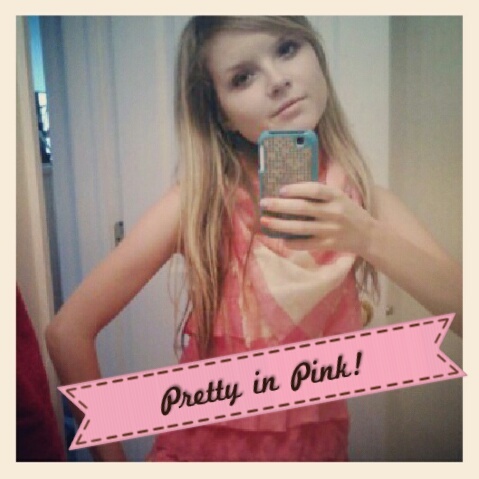 Anyways, the very sweet and beautiful Kat just tagged me in the Lactose Free Lizzie Food Award. It is award season, after all, with the Golden Globes and SAG Awards and the Oscars all coming up within the next month or so! Winner–Oikos! I’ll admit that I’m a diehard Oikos fan (the original Stonyfield organic kind, not the new Dannon variety), so all of their flavors are winners in my book, but the superfruits takes the cake! Winner–Gardein! I actually love all these veggie burgers, but the Gardein has the most protein, 17 grams in one burger. Not too shabby! Winner–Archer Farms almond peanut cashew butter! Obviously, almond butter is my hands-down favorite nut butter, but this one has the creamiest texture and a great mixed nuts taste. Winner–Alexia sweet potato tots! I love these crunchy little nuggets of sweet potato goodness. They’re much healthier than typical tater tots, because they’re baked not fried and cooked in just a little olive oil. Definitely my favorite way to enjoy my favorite veggie! Winner–peanut flour! All three of these are staples in my daily eats, but I can’t deny the amazing-ness of peanut flour. It’s a great sub for flour, is delicious as a protein powder, works well in microwave mug cakes and (my personal favorite) is beyond yummy mixed into a paste with water! 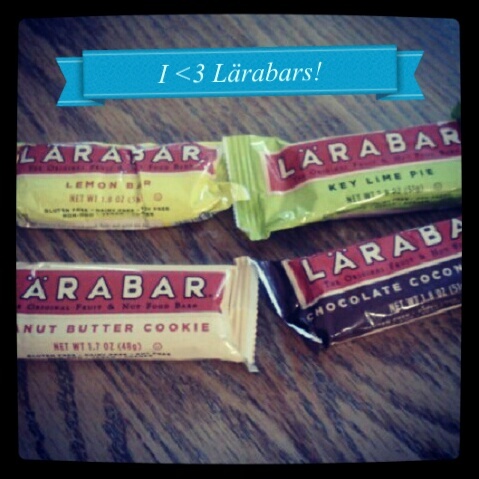 It’s like a higher protein version of nut butter! I’m passing the award onto… Aja @ Writing and Recovering, Chloe @ LightOnMyFeet and Lena @ Fit on the Rocks! What’s your nominee for most versatile product? What is one food you’ve been obsessed with lately?